Welcome to the Barton Real Estate website. 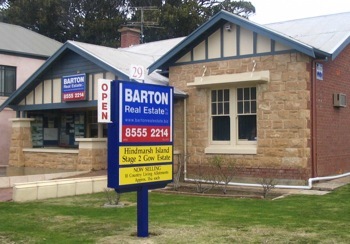 The team at Barton Real Estate are highly experienced Real Estate Agents with a wealth of local knowledge. Areas that the team specialises in are Goolwa, Hindmarsh Island, Middleton, Port Elliott and Victor Harbor. Goolwa is a favourite holiday destination for many South Australians. In just over an hour's drive from Adelaide, tourists and holiday makers can expect to find beautiful beaches, a tranquil setting of the Murray River meeting the ocean and all the water activities one could dream of. Fishing, sailing, jet skiing, surfing, diving or just lazing by the beach in summer, its all here. More and more Australians are finding the grass is greener and making the change to live where they used to holiday for two weeks a year. Technology and improved transport systems have made commuting far easier than it ever has been and allowing greater freedom from work pressures. Have a look through the properties Barton Real Estate have for sale and see how easy it is to make that sea change.